Standing at the head of the Village Green, this outstanding Norfolk Country pub/restaurant combines traditional period features with stunning modern-day comfort and luxury hotel accommodation. We pride ourselves on the quality of our ale, which always includes a selection of four Real Ales always on tap; Woodfordes Wherry, Adnams and two guest Ales are always available. The accommodation, consisting of 6 beautifully designed en-suite bedrooms, is ideal for an overnight stay or a longer weekend break. 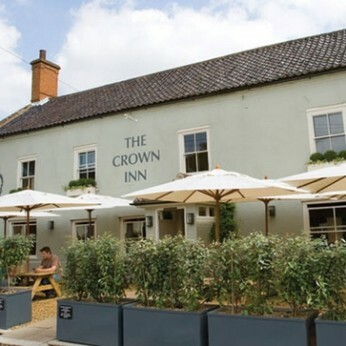 Whether you’re looking for a relaxing drink or a short break away, The Crown Inn at East Rudham, Norfolk has it all. We are delighted to announce that we are now providing all of the catering at Fakenham Race course, where we can cater for your larger parties and events.